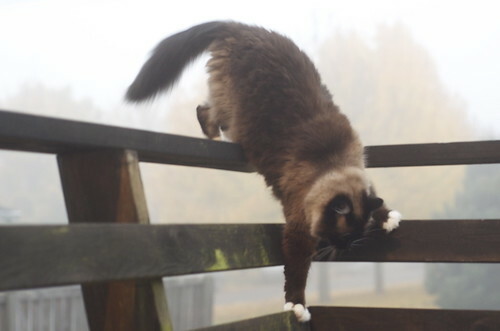 Here's our lovely acrobat cat doing a little fancy footwork in the fog. Cats are very graceful when climbing up, but not so much when climbing down. You can do it Charlene! Don't worry. I was waiting below, ready to catch her. Ha! Silly girl. Cats are so dignified most of the time that it makes their undignified moments that much funnier. She is just showing off her beautiful white gloves! As a child, I always thought the poet must never have owned cats, as storms with their loud crashings and bangings and thudding of fat raindrops on glass more accurately described the 'little cat feet' that stampeded through the house during the night. This is definitely a favorite Butterbean photo. So adorable. Best wishes, too, for MISTER (A252380), who features in the "How about this cutie pie?" section opposite. I love that right front paw!